Douglas fir commemorates two famous plant hunters: Archibald Menzies, who first described and collected specimens from the tree, in its Latin specific name, and David Douglas, who sent the first cones and seeds back, in its vernacular name. We are continuing to feature this tree in our archive for its connections, even though we have lost our venerable specimen to the gales on 3 January 2012. 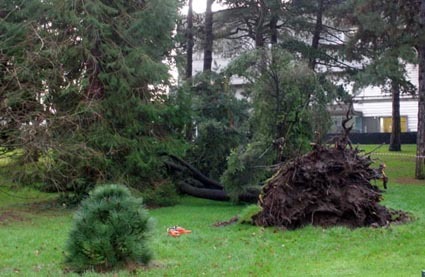 The tree came down just behind the Kelvin statue, while a nearby Cupressus was damaged enough to necessitate felling. 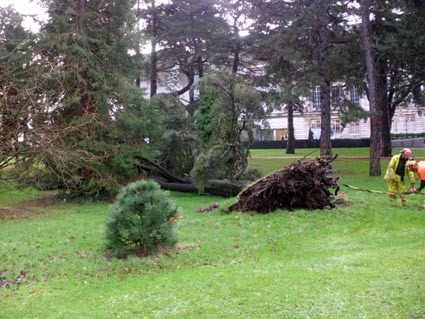 Regrettable losses but on a minor scale compared with the extensive damage suffered by Edinburgh Botanic Gardens during the same gale. In the absence of a documented date of planting, there was enough interest to take the opportunity to examine the stump with its shallow exposed rootplate. With the help of Dave Brown, Dendrochronology Laboratory, QUB, a slice of the stump was taken and prepared for ring counting (see below). There is considerable variation in the tree's growth rate over the last decades, which can be taken as a reflection of conditions experienced during the tree's lifetime. 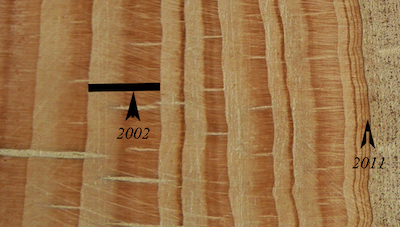 The 1940s were clearly a period of stress as can be seen from the narrow or missing tree-rings, and this pattern occurs several times during the life of the tree, in particular during the period since c. 2005. Further analysis on several radii might firm up more details, but work done so far gives a good indication of the tree's history. We can estimate that our Douglas Fir began growth in 1856 and was perhaps planted in 1858. This means that it was planted a few years after the completion of the Palm House in 1851 and long before the construction of the Tropical Ravine in 1889 or the building of the nearby Ulster Museum in 1929. The very narrow rings in the last few years may indicate that the tree was already stressed or weakened before it was damaged in the storm. Currently, the Botanic Gardens has no specimen Douglas fir, although there could be room for one at some time in the future. It might be of interest that already a young tree of Pinus jeffreyi 'Joppi' nearby will now receive more light and can thrive. This mirrors what happens in a natural forest situation when death of an old tree opens the canopy allowing seedlings to flourish. A garden, Botanic or domestic, is never a static place. As a foot note, we could add that during David Douglas' collecting trip to the Pacific North West, he met, in the 1820s, Thomas Drummond, one time Curator at Belfast Botanic Gardens. The two Scots got on well and became friends, although Drummond had left the Belfast Botanics and was travelling as an independent plant hunter. We could hazard a guess that seeds from the Douglas collection found their way to Belfast, but, as far as we know, there is little evidence to confirm that and the dates would suggest that our tree came from a later batch.